For me one of the best things about having kids has always been shopping for them. Hunting down that perfect toy for a birthday or going down the holiday shopping list, has always been something I look forward to. But I have to admit that once the kids get older and out of the toy stage, it becomes really hard to shop for them. This is exactly what we are experiencing at the moment, a child that has reached the age of 13 and has become harder to shop for. Teenagers these days have a lot of opinions on what we purchase for them. We can no longer buy the shoes we think are cool for Angel, because we’re not cool or young and have no idea what’s in style. Nor can we pick out games for his computer, I don’t even know what most of the games are, honestly. Plus at his age there are now more things he needs for school and after school activities, and it becomes hard to keep track of all those things. There’s been so many times that I have wished he could go into a store and do his own shopping. But that sounds like a disaster waiting to happen doesn’t it? How can you give your teen the power to shop, while still maintaining control of their purchases? Amazon has introduced a new way for teens to shop on their own while parents stay in the know. An adult Amazon customer can add up to four teens ages 13-17 to their account for free. With their own login, teens can shop independently and stream digital content by sharing their parent's Prime, while still keeping their parents informed so they can course correct if needed. Don't worry parents, you will still have full control! This gives parents and teens the flexibility and freedom to set spending limits that make sense for their family. Teens can shop Amazon using a parent-approved payment method and shipping addresses and parents can approve every item before it ships so there are no surprise purchases. Signing up takes moments for both teens and parents. Teens can also send an invitation to their parent through either SMS or email. The parent will choose a payment method and shipping addresses their teen can use when placing orders. Once a teen receives an invitation, they create their own login user name and password, and then download the Amazon App to start shopping. To get started, parents can visit amazon.com/forteens. I think this is a great way for teens to start learning more about budgeting and spending wisely. It's also a convenient way for teens to help shop for themselves, so you can cut down your to-do-list. Angel just had a birthday and this was the perfect opportunity for us to test the teen login out. With a $100 Amazon gift card and some cash he received as gifts, he was able to shop for himself. We were curious to see if he would order those pricey shoes he's been eyeing, maybe he would order something affordable and save the rest, or maybe he would get himself that tablet he's been talking about. It's kind of hard to watch a kid spend $175 on something frivolous, so we were hoping he would make wise decisions with his budget. 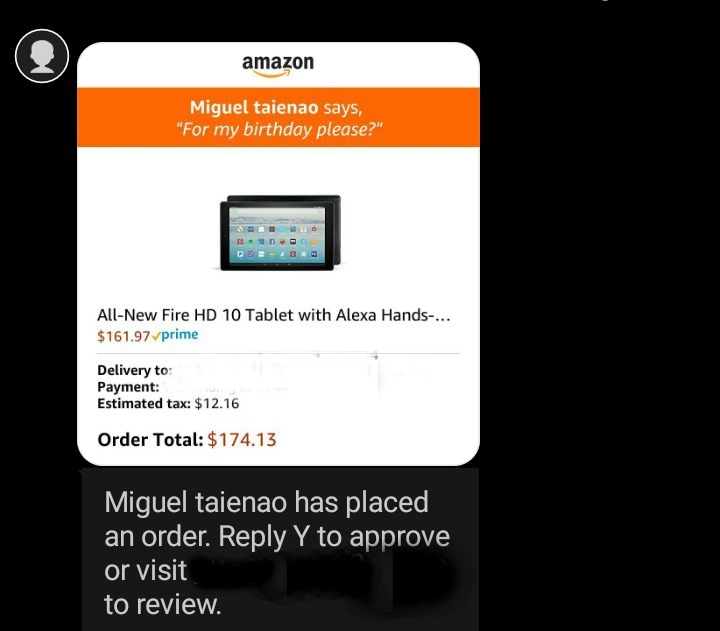 A text a few days later and we knew exactly what he wanted to spend his money on, the new Fire tablet with the hands-free Alexa that he's been talking about non-stop. This was actually what we hoped he would pick out since it's a sound investment and something he will really use. With the ability to approve his purchase, we made sure that all that money wasn’t spent on something totally unnecessary. Shopping from his own login Angel was able to really take his time and decide on the best purchase for his budget. This time he had a higher amount to spend but for his future purchases he will have a $40 per order limit. I think the experience was definitely a good one since we didn't pressure him or stand behind him the way we usually do at the store. He was able to browse Amazon on his own time and make a decision on his own without any pressure from us. With this service, teens can exercise smart shopping decisions with access to Amazon customer reviews and comparison shopping tools. If they happen to make a mistake, Amazon is there to help backed by their A to Z guarantee. If you're an Amazon customer then you know how good their customer service is. If you're a Prime member, your teen can enjoy Free Two-Day Shipping, stream thousands of popular TV shows and movies through Prime Video and access exclusive content and offers on video games through Twitch Prime. We are Amazon Prime account members so Angel will be able to access all of this through his new Fire tablet. Pretty cool! Angel is only 13 and will have a smaller spending limit for now, but I love that we can raise that budget as he grows and depending on how responsible he is with his shopping. I think we're really going to enjoy this new Amazon shopping experience, especially Angel who now feels more independent. Do you have a teenager who would love the independence of having their own Amazon login? Teens and parents can learn more and sign-up at amazon.com/forteens.